Jesus walked along the eastern wall of the great banquet hall, and I walked in sync with Him. There was an excitement in my heart about what the Lord was about to reveal to me. By now I had been visiting the Lord for months in the heavenly realms. In my humanness I had thought that I had “seen it all.” How silly was that idea? The Lord led me to a wonderfully ornate door. It was baroque looking and was covered with ornate and lavish designs. It appeared to be covered in pure gold. The heavenly light that was filtering down from the windows above seemed to create an ethereal glow within the very material of the double doors. For a moment I had wondered why I had not noticed these marvelous doors before. Then I remembered that the hidden mysteries of heaven need to be revealed to you by God. Two of the four angels that were walking with Jesus moved forward to open this pair of ornate ancient doors as we approached. When the angels opened the doors the sound of worship exploded into the great banquet hall. Jesus entered into a magnificent hallway that led upward at a slight angle. When I stepped into the hallway, my eyes were momentarily blinded by the glory and power of the brilliant light that was emanating from the other end of the corridor. Looking down at my bare feet I saw that I was walking on a golden pathway, and this helped to magnify the luminescence of the brilliant light that was flooding into this hidden passageway. I could feel the coolness of the material of the floor, and I could also feel the tangible glory of God flowing past me in waves and billows. The glory of God blew past me like the winds of heaven. The heavy, weighty, tangible glory of God poured past me like a mighty rushing wind in this place. It was wonderful, and I could have just camped out there. Tears began to stream from my eyes as the weighty glory of God filled my spirit. Jesus reached out with His right arm and put His hand upon my shoulder drawing me closer to Himself, and we continued to walk together. As we reached the end of the very long corridor, the Lord stopped and turned to look deeply into my eyes. The fragrances of frankincense and myrrh that I had been experiencing over the last few months were powerful and seemed to permeate the air that was rushing over us from the room that was just a few yards ahead. As Jesus gazed into my eyes, the brilliant glory from the massive room seemed to twinkle and shimmer from His beautiful pupils. Jesus smiled at me with delight. He said, “You are always welcome in this place. Come with me now.” My heart leaped with joy at these words, and I wondered where the Lord was taking me today. With that He turned and purposely moved forward stepping through an opening into the room. I was immediately awed by the volume of the sounds in this place. I looked out to see millions and millions of people worshiping God. The sounds of worship permeated the air, and it was obvious that thousands of angels were singing in unison with the millions of people that I was seeing. In fact, there were millions of angels in this place too. I was reminded of how I had first heard angelic singers in Newfoundland back in 2001. (This incident is depicted in Visitations of Angels and Other Supernatural Experiences #1 & #2.) This thought made me smile. I was actually flabbergasted by the sight that lay before me. Jesus continued to walk deliberately towards the center of this massive room. On either side of us were people who were all dressed in immaculate white robes. The Lord and I were walking down a wide row that appeared to be fashioned of a golden crystalline substance. The four angels who always accompanied me in the heavenly realms were walking in step with us as we approached the center of the room. Most of the saints in the room were so involved and engrossed in worship that they did not notice Jesus as He walked by. Occasionally, a person would see the Lord and would fall upon their face and worship the Lamb of God as He passed by. The people and angelic hosts here were singing incredibly beautiful and harmonious praises to God. The sound was the most beautiful sound that I have ever heard. They were worshiping the Lamb of God and singing songs of glory and honor to Jesus, “Holy, Holy, Holy!” There was such a powerful presence of unity, peace, and all-consuming love in this enormous place that it was simply overwhelming. I was totally enamored by what I was seeing, feeling, hearing, and experiencing. The Lord continued to move steadily through the massive group of people. From the top of the path that we were on I began to understand that we were in an enormous room full of glory and ethereal light. Looking to the center I saw the source of the light. It was the throne of God. It appeared to be about a mile or more away from us now. However, I could see incredible lights and colors phosphorescing within and around the throne. These colors seemed to be living. However, the glory around the throne was also very dark at times. The Father’s throne appeared to be covered in dense luminescent clouds, and every so often lightning and thunder would rumble forth from the midst of the glory making me wince. After a few claps of thunder and several flashes of lightening I became more comfortable with the mighty noises and flashing lights that were being emitted from the area of the throne. Though, it was impossible to see the image of the Father behind the dark clouds hovering around His throne. This spectacle was still quite unnerving. The reverential fear of the Lord was upon me and I fell upon my face. I was quite undone to be in this place and the reverential fear pressed in upon me all the more. Had I not been in the company of Jesus, I am not sure that I would have survived! It became obvious to me that Jesus was headed to the throne. This understanding gave me pause and the awe of God poured over me like a river of power. The closer that we came to the throne the greater the reverential fear of the Lord grew within my spirit. As we proceeded to the throne, I purposed in my heart to study my surroundings carefully. It is actually impossible for me to accurately depict the vastness and scale of the room that the Lord and I were walking through at that moment. It is possible that the throne room was miles in circumference. However, I am certain that the room was somewhat circular with the Father’s throne located perfectly in the center. This is total speculation on my behalf. The Father’s throne was the source of extreme glory and power. It is possible that the Father’s throne is the source of all of the light and glory in the heavenly places that I have described to you. Again, I am not certain. There appeared to be a crystal cathedral type ceiling soaring high above the room. Around the throne in the distance was a beautiful lake or sea of crystal that appeared to flow from and have its source coming from the very throne of God. Both of these continuously reflected the lightning and glory that emanated from the Father’s throne. As Jesus and I continued to walk down the sloping walkway that led to the center of the room I continued to examine my surroundings. It appeared that there were literally millions upon millions of people clad in white attire in this place worshiping God with a vigor that I have never witnessed upon the earth. 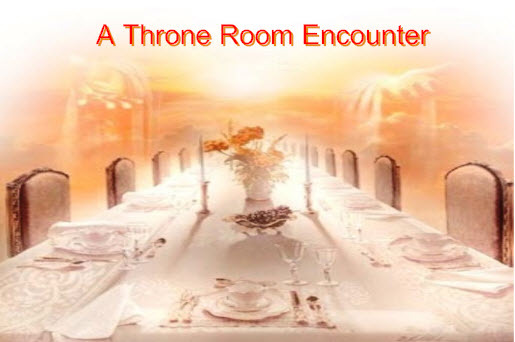 The experience of being in the throne room changed my life. Yes, heaven is real! Once I turned to see Jesus smiling at me as I was looking around and examining my surroundings. My investigation seemed to cause a bright smile to fill the Lord’s face. The Lord placed His hand upon my back again. This supernaturally strengthened me and gave me courage to move even closer to the throne. After some time we began to draw closer to the throne. The sound of the worship was so loud and intense that the very ground under my feet seemed to quake. It was then that I began to notice angelic beings that were flying around the throne. The colors and the glory that emanated from the throne made it difficult to look at the throne for no longer than a second or two. However, it appeared to me that these angels were moving acrobatically in and through the glory surrounding the throne. They were singing and worshipping loudly and with a supernatural passion. As these angels darted about, their multifaceted wings dispersed the glory of God in all directions at once. Phosphorescent colors cascaded in all directions around the throne to be reflected by the crystal cathedral and the waters surrounding the throne. Perhaps these were seraphim or cherubim. I am in no way certain, but these angelic beings worshiped the Lord and their wings cascaded God’s glory in every direction as they flew acrobatically around the throne. As we drew nearer I saw that the Father’s throne was surrounded by other much smaller very luxuriant chairs which seemed to be constructed of gold and red velvet. Of this I am not sure. Each chair was of Victorian looking design and had very ornate carvings upon the arms and legs. These chairs were quite large by earth’s standards and had similar styled footstools at each one. It dawned upon me that these may have been the twenty-four elders spoken of in Revelation. Again, I am not certain and this is total speculation on my part. Although, when I sought to look at them I was unable to see them clearly as they were bathed in brilliant light and glory. Jesus continued to walk up to the throne. When we reached the bottom of the platform I saw twelve large stairs leading up to the throne area. These large stairs seemed to be made of gemstones like diamonds, rubies, sapphires, mother of pearl, topaz, emerald, turquoise, amethyst, and others perhaps, but I am not sure. They emanated the glory and lights around the throne with brilliant reflections. Each step was about eighteen inches in height. For a moment I discerned the words “mercy and justice” flashed upon these foundational steps of the throne. When Jesus began to walk up the steps I noticed that there was a magnificent place established for Him on the right hand of the Father. Remaining at the bottom of the throne I stood still like a statue paralyzed by the reverential fear of God and the intense glory. Thunder once more roared in my ears and lightening bolted over my head at that instant illuminating the ceiling and the crystalline waters as Jesus sat down upon His throne. I closed my eyes and fell upon my face and remained in that position for a long time. I entered into the worship of the Lord with all of my spirit and soul, and the sensation was exhilarating and amazing as we sang. "Worthy is the Lamb who was slain to receive power and riches and wisdom, And strength and honor and glory and blessing!" (Revelation 5:12). After a long time a persistent buzzing sound filled my ears, and I looked up to see a large angelic being hovering near my head. It was similar to the angels that I had seen at the place I call the vault of mantles. Slowly I rose up upon my knees to see the cherubim dart back into the phosphorescent glory of the Father that was radiating around the throne. In this place the tangible fear of the Lord was overwhelming, and for a moment I wondered if I was going to live. I wondered why the Lord had brought me to this magnificent place. Would I live, or would this be the day that I stood before the throne of God’s judgment and grace? At that instant I looked up to see Jesus sitting upon His throne in His rightful place at the right hand of the Father. The Lord smiled at me, and once again hope bubbled up within my spirit that I might live and not die. Jesus motioned for me to join Him. Astonished, I stood up on my wobbly legs and walked slowly up the twelve stairs to stand beside the right hand side of Jesus (Revelation 3:21). My senses were overloaded by the sights and sounds surrounding the throne. The power of God’s glory in this place is impossible for me to describe accurately. The volume of the sounds and the sheer size of this crystal cathedral of God were too much for my human mind to comprehend in that moment. It took a long time, but gradually I began to adjust to the overwhelming and tangible presence of the glory that was radiating from this place. Jesus made a gesture to me with His chin indicating that I should turn around and look out into this massive room. Today I believe that I was totally invisible as I stood there and no one else in the room saw me. I had been watching and observing Jesus for a long time. I was totally absorbed in the majesty and grandeur of the Messiah as He sat upon the throne. Truly Jesus is the High Priest forever according to the order of Melchizedek (Psalm 110:4; Hebrews 6:20). I did not want to leave His presence nor did I wish to look at anything else in this place save for my Savior. There was no need to pray or even think. I just wanted to luxuriate in being here in the very presence of the Most High God and worshipping the Lord with my entire being. At that moment I realized that tears were flowing from my eyes and my heart was burning with a love and passion for God that I had never known. I looked into the eyes of Jesus again. Once more the Lord smiled at me, and He raised His chin slightly for a second time indicating that I should look around. I turned around to look upon the masses of people that were gathered around the throne. Below the river of God reflected the glory of the throne in unison and in harmony with the vaulted crystal ceilings of this amazing and magnificent room. These created perfect acoustics for the worship that was ongoing in this massive crystal cathedral. Millions and millions of saints in white robes were arranged in a massive circle around the Father’s throne. God’s angels of various kinds were worshipping the Lord in unison with these saints. There were balconies at various levels where angels sang and played musical instruments worshipping God in spirit and in truth in unison with the millions of saints below. The throne room was perhaps miles in circumference. At one point I heard a massive clap of thunder and I realized that something was about to transpire. Perhaps this was what the Lord had wanted for me to witness. My attention was drawn to the area in front of the center of the platform which surrounds the throne. I saw a young man approach the throne of the Lord and he was accompanied by several angels. His head was bowed and he was trembling in great fear. Somehow I knew that it was time for this man to stand before God. I saw two large books brought to the Father’s throne by angelic beings. I understood that these books were this person’s books of life. The books in the angel’s hands were similar to the millions of books that I had seen in the place I called the Father’s library earlier. One of the elders came forward and began to read from one of the books. This man’s stature was very regal and his hair was so white that it seemed to glow. His words were clear and pronounced and articulated perfectly. The elder spoke for what seemed like hours sharing in great detail events from the man’s life. As he spoke images of the events depicted were visible above the throne. All the while the glory of God emanated and shot out from around the throne. I heard a sound and saw Jesus rise up and walk down to stand beside the man at the foot of the throne. The Lord began to speak on the young man’s behalf. I was not able to understand the words that Jesus was saying but I understood that Jesus was making a defense for this man. Jesus acted as his advocate just as a trial lawyer would defend someone in a court of law upon the earth. This man had made Christ his Savior on earth and had not denied the Lord. And at this moment Jesus was defending him before the Father as Abba Father sat upon His throne. This man’s sins had been washed clean by the blood of the Messiah. He was about to enter into heaven for eternity as Christ spoke upon his behalf. Perhaps what I was seeing was what Jesus referred to as the resurrection of the just in Luke, chapter 14. In that passage the Lord referred to how people of the earth would receive a reward in heaven for their genuine benevolent acts upon earth. As I watched this scene unfold before me I understood that this man’s gifts to the poor and alms were coming up before the Father (Acts 10:4). I also understood that he was going to reap a heavenly reward for the things that he had done during his earthly life to help those who were less fortunate than him. I watched as this man received a beautiful crown of righteousness from one of the elders in attendance. At the command of Christ, two angels came forward to place a brilliant white robe upon the young man’s shoulders. The young man then turned to join the millions who began to worship God in unison. I was amazed by what I was experiencing. After a moment the Lord returned to His place at the right hand of the Father. However, over the next several hours I watched this scenario play itself out time and time again. I may have actually been in this place for days, but later when I returned to my prayer room I was surprised to find that only about nine hours had passed. I must have witnessed hundreds of individuals come to stand before the throne of the Father. I watched as their lives were played out in the midst of the heavenly realms. For each one of those who knew Jesus as Savior and Messiah, I saw Jesus stand and speak upon their behalf. The Lord stated their case that they might be acquitted and their iniquities imputed before the Father. Jesus would defend them and the many were granted new robes and some received crowns of righteousness (James 1:2; 2 Timothy 2:4; 1 Peter 5:4; Revelation 2:10). I understood that their sins were no longer recorded in their book of life, and they were given heavenly rewards and crowns of righteousness. I saw many saints who received these beautiful golden and jeweled crowns of life and righteousness lay these heavenly treasures at the feet of Jesus before the Father’s throne (Revelation 4:10). Worthy is the Lamb who was slain To receive power and riches and wisdom, And strength and honor and glory and blessing!...Blessing and honor and glory and power Be to Him who sits on the throne, and to the Lamb, forever and ever! Then there would be a thunderous chorus of “amen,” and the whole family of God would worship the Lord once more. I witnessed this dynamic transpire time and time again. After I had witnessed several people approach the throne to stand before the one true holy and righteous God, it occurred to me that these individuals’ eternal destinies were being decided. The Lord was rewarding them based upon the choices that each had made and how they had lived their earthly lives. An intense desire to pray for each one welled up inside of me, and I began to intercede for each one in turn. Some did not receive new robes or crowns of righteousness. It appeared that Jesus wept when this happened, and I would pray all the more. After a long time I turned to see Jesus motion to me calling me to Himself. To see Kevin’s New Book Click HERE.